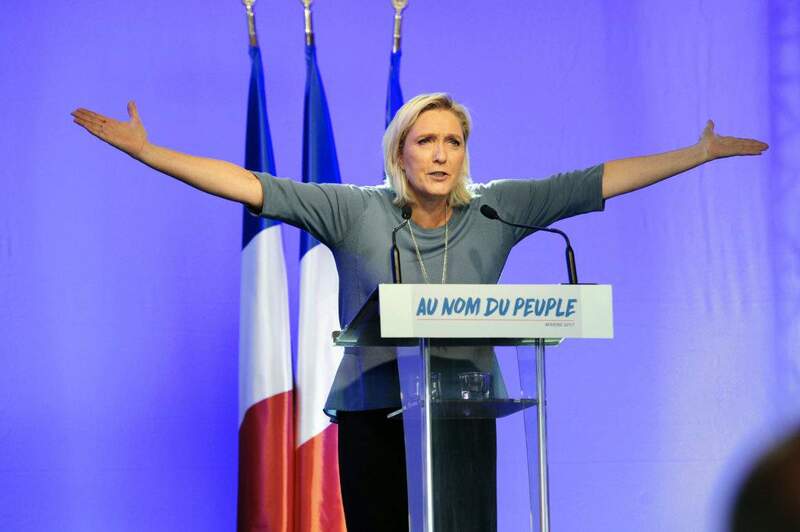 Marine Le Pen, the far-right nationalist leader, has gained more support in her campaign to become the next president of France. On Monday a poll showed her ahead of the other two major candidates. They are the centrist Emmanuel Macron and conservative Francois Fillon. But Le Pen could still lose the final May 7th election to either candidate. The Paris-based political research group Opinionway operated the study of French citizens' opinions. The group asked people who they planned to vote for out of the five total candidates. If no candidate wins a majority of the votes on April 23, the two candidates with the most votes face each other again in May. The poll shows Le Pen winning 27 percent of the first vote; more than any other candidate, but not a majority. She would then likely face either Macron or Fillon in the next round. But against either candidate in May, Le Pen would likely lose. Macron would win 58 percent of the vote against her 42 percent. Fillon would win 56 percent to her 44. French investors are concerned with news of Le Pen's lead in the poll. She has suggested France stop using the currency called the Euro and calls for a vote on leaving the European Union. She also suggested putting greater taxes on imported goods and contracts of foreign workers. The far-right has now made its intentions clear. The Nationalist leader remains under house arrest. I entered the essay contest of the next round. 1.The poll shows Le Pen winning 27 percent of the first vote; more than any other candidate, but not a majority. I enjoy watching TV more than any other pastime. He probably knew more than any other man of his age. 2.She has suggested France stop using the currency called the Euro and calls for a vote on leaving the European Union. GOP calls for delaying a vote on the New START nuclear-reduction treaty with Russia are already in full song. Polls show rising but still uncertain support for independence among Scots: hence Mr Cameron's calls for a swift vote.